"Mr. J.L.B. Matekoni smiled. They were always having tea, as far as he could work out. There was the first cup, served shortly after they arrived in the office in the morning, and then there was the ten o'clock cup, which was sometimes taken at nine thirty in the hot weather. That was followed by the tea which was brewed at eleven thirty (the mid-morning tea), and of course there was tea immediately after lunch and again at three in the afternoon. He thought it was a good thing that the red bush tea contained no caffeine, or Mma Ramotswe would surely find it difficult to get to sleep at night, with all that caffeine in her system. Yet Mma Makutsi drank ordinary tea, which had ample quantities of caffeine in it, he believed; indeed he thought that this might explain why she was sometimes so tetchy with the apprentices, especially with Charlie. Mind you, anybody might be forgiven for being irritated by Charlie, with his constant boasting and that endless silly chatter about girls; even one with no caffeine at all in his system could find himself snapping at such a young man." Just as a good TV series eventually must end at the right time, so must this series of books, I suppose, although I certainly wouldn't object to a tenth book. I will greatly miss this fine cast of characters, beautiful Botswana, and all the references to tea. Even when they sit around drinking tea, or perhaps especially when they sit around drinking tea, their world is warm and inviting. As I read each book in this series I think that the one I'm reading is going to be my favorite. 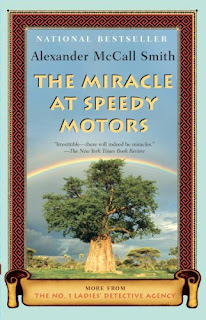 Miracle at Speedy Motors was no different. I laughed, sighed and even teared up a bit. These books are a wonder and delight! I can't believe that I'm nearly finished with this series. Each book has been enjoyable, and I hate to end my relationships with the characters. Thanks for your comment, Christie!